AmazonSmile – New Hope, Inc.
Support New Hope While You Shop! Select New Hope as your charity of choice on Amazon.com and .5% of your total purchase will be donated directly to New Hope! Participation in the AmazonSmile program is easy and cost-free. 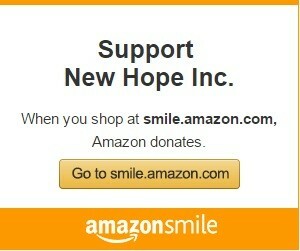 Simply click on the box below and you will be setup to shop Amazon.com to benefit New Hope. We thank you for your support!